Thanks to Dr. Saima Absar, Chughtai Lab Lahore (Pakistan) for contributing this case and Dr. Raul S. Gonzalez, Beth Israel Deaconess Medical Center, Boston, Massachusetts (USA) for writing the discussion. To contribute a Case of the Week, first make sure that we are currently accepting cases, then follow the guidelines on our main Case of the Week page. FRESNO, CALIFORNIA (USA). Large community and hospital-based pathology group with 17 pathologists. Our practice includes: 600+ bed hospital with UCSF affiliated non-pathology residency training, 5 additional local and nearby hospitals, large outreach practice, molecular lab, and state of the art information system tools. Our AP laboratory is a separate building and privately owned. With the retirement of two pathologists and one of our hospital affiliates expanding their territory we are looking to add a pathologist to our group with AP/CP boards to cover this hospital. Preference will go to candidates with strong general pathology skills. AP/CP boarded or eligible and California state licensure is required. Excellent benefits and compensation. Partnership track opportunity. Please visit our web site www.pathology-associates.com and hospital site www.communitymedical.org. (1) As of 14 November 2018, we are no longer paying for case contributions to the Case of the Week. We will pay contributors for cases sent prior to this date, even if not yet posted. We made this change because it was inconsistent to pay for images contributed as a Case of the Week but not for other images. (2) We have updated the list of Residency Directors, which is posted on our Jobs page just below the blue box and also posted here as an Excel download. Please advise us of any updates. (3) We have updated the list of Fellowships Directors, which is posted on our Fellowships page just below the blue box and also posted here as an Excel download. Please advise us of any updates. 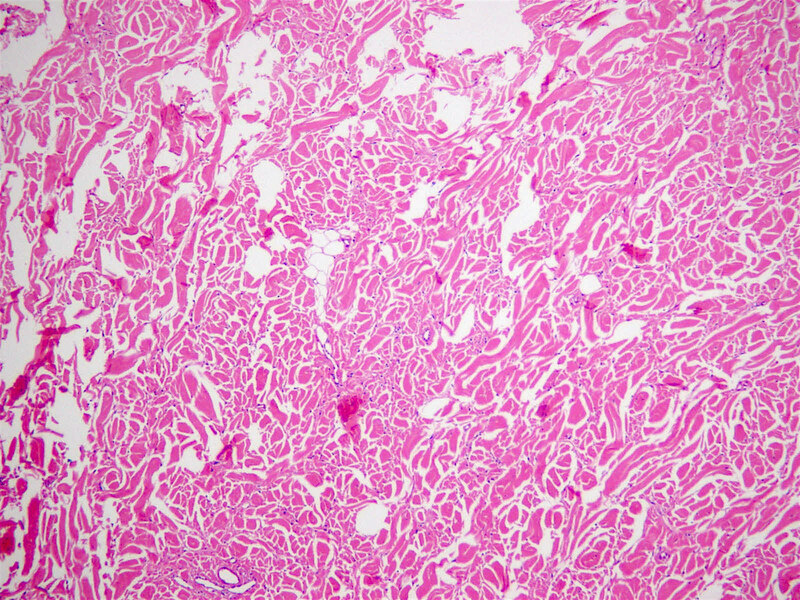 A 45 year old man presented with a painless mass on his forehead, which was excised. 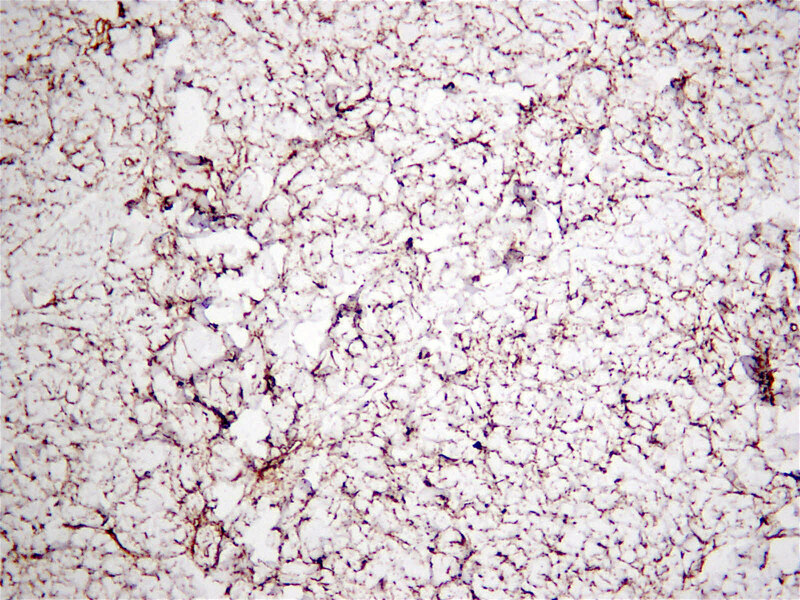 The specimen consisted of 2 distorted tissue fragments, 5.5 x 2.5 x 1.5 cm and 3.5 x 2.5 x 1.0 cm. The largest was skin covered. 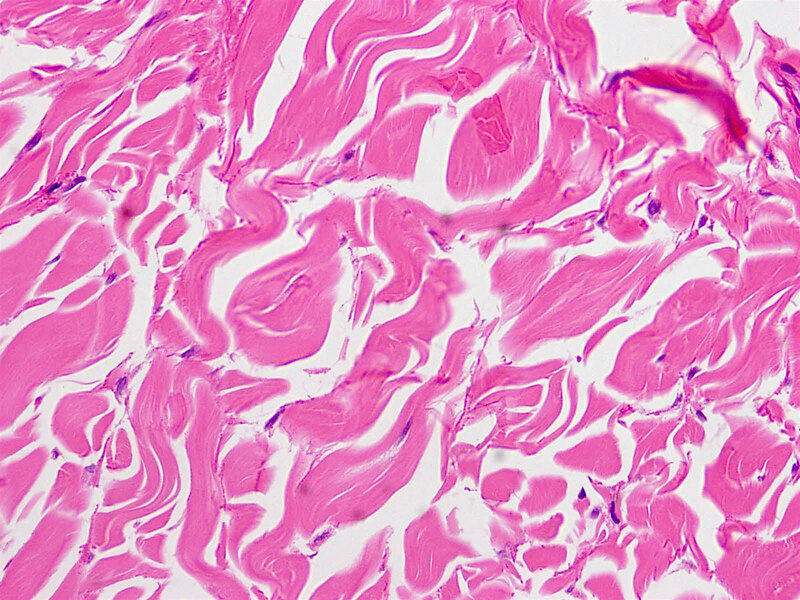 Serial slicing revealed a firm white fibrotic cut surface. Nuchal-type fibroma is a benign, unencapsulated fibrocollagenous proliferation most commonly seen in the back of the neck in middle aged men, although it can occur in the extremities or other locations (Am J Surg Pathol 1995;19:313). 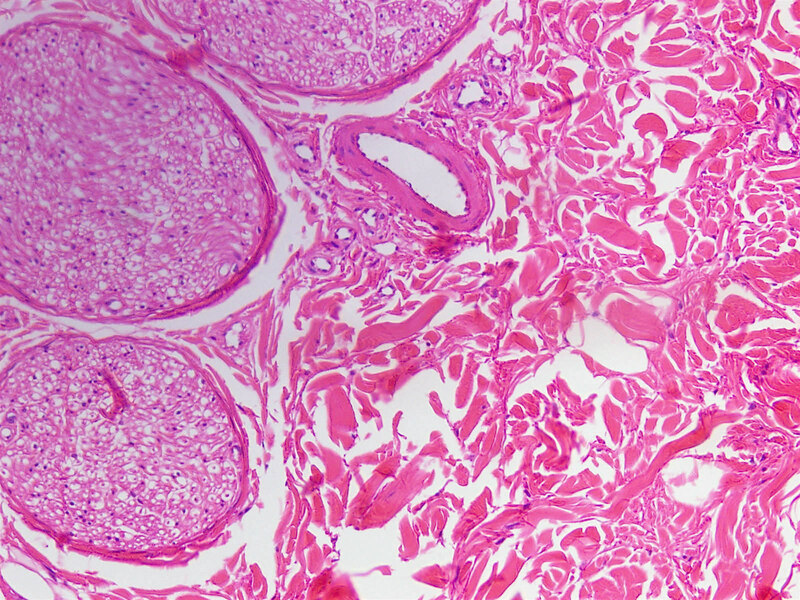 Similar lesions with identical histology can occur throughout the body in patients with Gardner syndrome, which are termed Gardner-type fibromas. 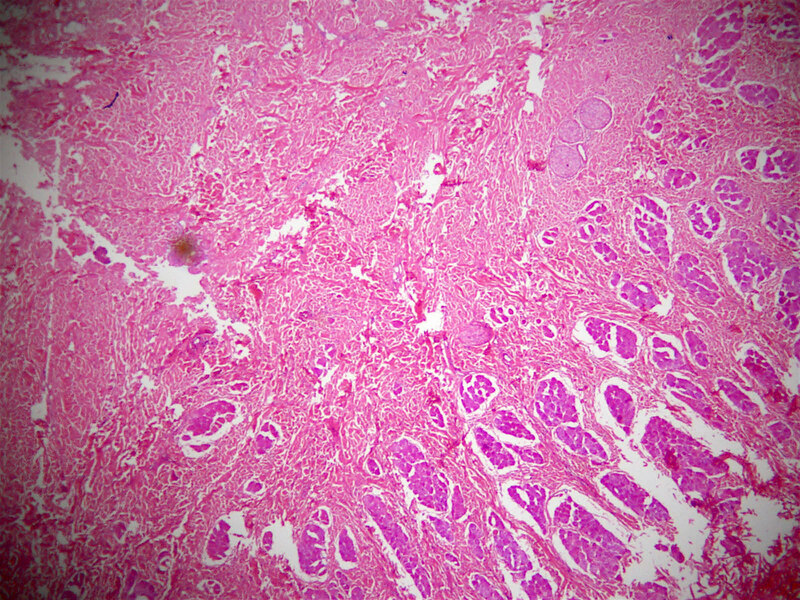 Histologically, nuchal-type fibromas consist of dense, bland, markedly hypocellular collagen with sparse intermixed fibroblasts in no particular pattern. Other soft tissue entities may appear in the clinical differential diagnosis (Ann Otol Rhinol Laryngol 2000;109:52) but the lesion is generally straightforward to diagnose histologically. 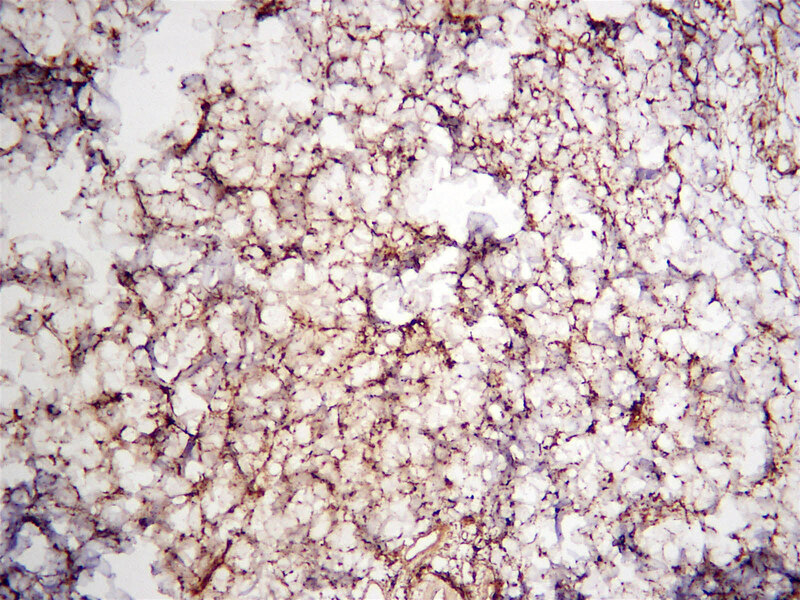 Immunohistochemistry shows the fibroblasts are positive for CD34 and CD99 (Am J Surg Pathol 2001;25:970) and negative for smooth muscle actin. 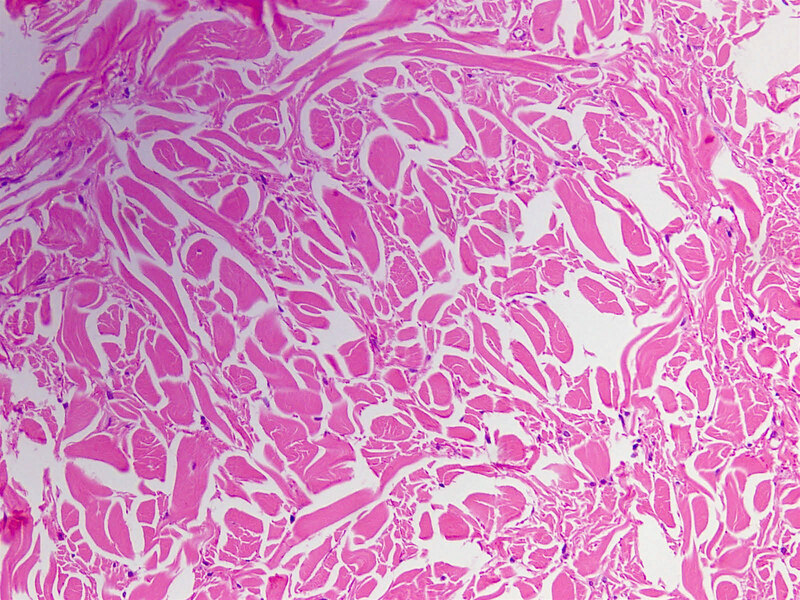 The collagen can expand into adjacent skeletal muscle, adipose tissue or dermis, entrapping adnexal structures or nerves, as seen in this case. 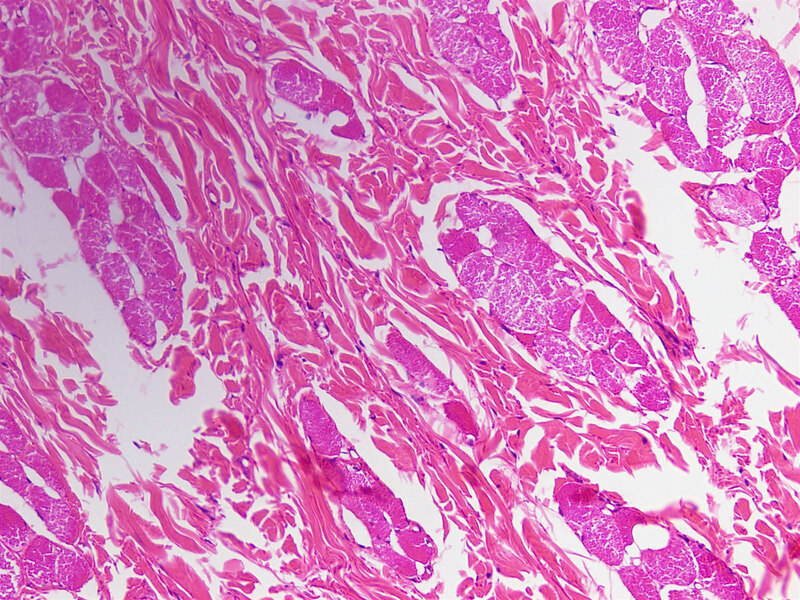 Entrapped fat should not lead to the diagnosis of fibrolipoma, which is well circumscribed. Nuchal-type fibromas are generally solitary and asymptomatic. They can grow to several centimeters in size, and patients tend to present several years after the lesion first becomes visible. They can rarely be multifocal (Ann Dermatol 2015;27:194). These lesions can recur if not entirely excised but malignant behavior has not been documented (Cancer 1999;85:156). Nearly half of patients have diabetes mellitus.